In which years were local floods recorded? How high did they rise? How long did they last? Is there a local flood plan? Does my house become isolated, or do I have to evacuate? At what river height, at the closest official gauge, will my home be flooded? Does my home become isolated? Do I have to evacuate and where do I evacuate to? Where is the catchment area in which rainfall will cause floods near my home? Don’t wait for a flood to learn what to do. Now, before the flood, is the time to learn. Firstly, know how the Flood Warning System works. The Bureau of Meteorology (BOM) issues forecasts and warnings. In particular, the BOM issues a Flood Watch or similar advice of possible flooding, if flood producing rain is expected to happen in the near future. The general weather forecasts can also refer to flood producing rain. The BOM issues a Flood Warning when flooding is occurring or is expected to occur in a particular location or area. When flash flooding is expected, a Severe Weather Warning is issued to alert to that possibility. Where possible the BOM will issue local flood advices, informing you of the likely effects of the flood and what you should do. The BOM uses the following flood terms. It is important to know what they mean. Minor flooding: Causes inconvenience. Low-lying areas next to watercourses are inundated which may require the removal of stock and equipment. Minor roads may be closed and low-level bridges submerged. Moderate flooding: In addition to the above, the evacuation of some houses may be required. Main traffic routes may be covered. The area of inundation is substantial in rural areas requiring the removal of stock. Major flooding: In addition to the above, extensive rural areas and/or urban areas are inundated. Properties and towns are likely to be isolated and major traffic routes likely to be closed. Evacuation of people from flood affected areas may be required. Local Flooding: Used where intense rainfall could be expected to cause high runoff in limited areas local to the rainfall, but not necessarily leading to significant rises in main streams. Flash Flooding: Flooding occurring in less than six hours of rain, usually the result of intense local rain and characterised by rapid rises in water levels. They are difficult to predict accurately and give little time for effective preventive action. The BOM will issue a Flood Watch which provides early advice of potential flooding. SES will release this Flood Watch locally. Monitor the BOM and NSW SES advice. Some lower carparks near the river will already be flooded and closed. After 5.2m, the Browns Creek Flood Gate will be closed and the pumps turned on. Between 5.8m and 6m the exit to Lismore Caravan Park in Dawson Street can be covered. Some rural roads may be flooded. The SES will issue ongoing Flood Bulletins. Between 9.2m and 9.36m, possible overbank flooding at the junction of Wilsons River and Leycester Creek near the Winsome Hotel in North Lismore. Some access roads into Lismore start to close. The effects of flooding in Lismore CBD varies and is influenced by catchment conditions, distribution, intensity of rainfall and patterns of stream flow in the Wilsons River and Leycester Creek. Between 10.2 and 10.6m AHD (situation pending) the CBD levee may overtop. It will overtop first at the Browns Creek Spill-way near the Police Station in Molesworth Street. The CBD will begin to flood if it does. Prepare for an Evacuation Order. If unable to remove stock, lift it to a safe, flood-free height, then secure your property and go to a safe, flood-free location as soon as possible. Floodwater will flow over the Browns Creek Spillway near the Police Station, into the CBD – at times with such velocity that people may be swept off their feet. Local traffic will become congested. All roads out will begin to flood and could be closed to all traffic within 60 minutes. The 1974 peak flood height was 12.12 metres AHD. Evacuate now! How will you be notified? Emergency Service sirens may be sounded. Evacuation Orders will be broadcast on local radio and TV. SMS alerts may be sent to local phones. If time permits, volunteers will door-knock. If the levee was overtopped a number of businesses will have had floodwater over the floor of their buildings. Only return once NSW SES issues an ALL CLEAR. Before entering your building, ensure it is safe to do so. Go to www.floodsafe.com.au for information related to returning to a flooded premise and recovery. For more information on how to be well prepared in the event of a flood or other hazard, see our Plan & Prepare page. On this page you will find information on how to prepare and cope with a flood before, during and after the event as well as useful contacts and information including the flood heights and floor levels document. The Disaster Dashboard is an online tool that includes all the information you need during a flood, with links to the right authority with the best information. We send out mobile phone SMS alerts during times of flood. 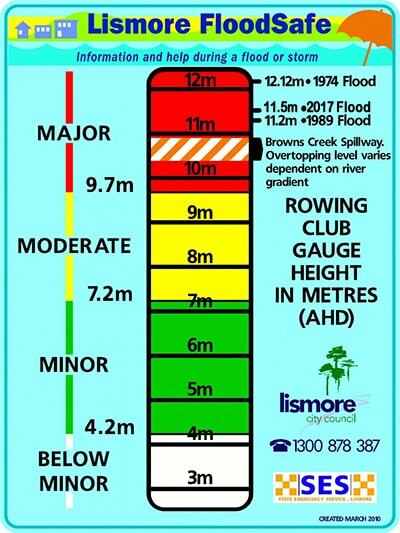 We begin the SMS alerts when we receive official word that Lismore will reach the minor flood level of 4.2 metres. We send an alert every 6-8 hours after that or when authorities alert us that river heights are rising. We continue to send alerts until the flood reaches its peak. Phone us on 1300 87 83 87 and register your phone number or complete the Flood Alert SMS Registration. In life-threatening emergencies phone 000. For more information on smartphone apps and online resources that might be useful during a flood or other hazard, download the Red Cross Guide to Emergency Apps and Online Resources. When evacuation becomes necessary, either by emergency workers or you decide to leave, be sure to shut down household utilities and empty refrigerators and freezers, leaving doors open. For a quick guide on what to pack that you can keep at home, download the resource Get Packing - Emergency Basics Kit. If you evacuate voluntarily make sure you tell a member of the family, a friend or a neighbour and the NSW SES or police when you are going (and where, if you know) so that authorities can account for you. Listen/watch for flood reports and instructions. Follow all instructions by emergency authorities and react to changing conditions. If you have to evacuate, fill your petrol tank and stock your car with emergency supplies to be evacuated with you. Southern Cross University is the Evacuation Centre for Lismore in times of natural disaster. The SES and other emergency services will direct affected residents to the university when the Evacuation Centre is operational. It's a good idea to prepare a flood action plan based on the following information and check lists. 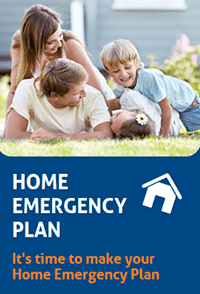 Both the Australian Red Cross and NSW SES have Home Emergency Plan templates that you can use to create an effective strategy to protect yourself and your family during an emergency. Click on the images below to download the plans. Alternatively, Australian Red Cross has a ‘Get Prepared’ application that allows you to create an emergency plan on a mobile device. There is also information on this webpage you can follow. How does SES Plan for Floods? Watch the video: Do You Live Behind a Levee? Apart from flash floods, most other floods allow some warning time. In many situations, unless a really major flood is expected, you may be able to keep floodwater from entering your house, if you are prepared to take the necessary action. So plan and prepare ahead of the event. CAUTION: Even if you take such measures to protect your home, you should still have a further action plan in case your flood-proofing fails. Keep a list of emergency phone numbers near the phone. For example, your local SES office, police, ambulance, hospital and essential services, for example, gas and electricity. If you live in the country you may have to move livestock, machinery, pumps, irrigation equipment etc to high ground. Prepare by knowing the flood heights that affect your property and knowing where higher ground can be found. Remember that higher ground may become isolated with rising floodwater. If you are likely to be isolated by floodwaters, paint the name of your property on the roof in large letters. Flood warnings are made available by various means including the internet. They are also provided by radio, by the emergency service media, television in some instances, or by direct contact in some areas. When heavy rainfall is being experienced, it is in your interest to find out whether any flood warnings are current by calling the Bureau of Meteorology or visiting its website. When you have either been informed or you find out that a flood warning has been issued for your area – NOW is the time to put your planning and knowledge to use. Know the whereabouts of other family members and near neighbours and whether they know what is happening. Listen to ABC and/or local radio for further flood bulletins. Ensure your portable radio has fresh batteries. Remove possessions to flood-free storage and, if possible, protect electrical appliances etc. All poisons, chemicals etc should be stored above predicted flood height. You may be isolated in your own home or you may be evacuated some distance away, so be prepared. It is always sensible to prepare a checklist of important family records. Include a list of important records including wills, birth/marriage certificates, banking, financial records etc. Have these stored in a secure location and ready to be packed in a waterproof bag for inclusion in your emergency kit if you need to evacuate. Click on the links below for helpful information. Move household items to a high place. Flood-free storage for lighter household items can often be built into ceiling space, however your ceiling or upper floor may not be able to safely support the additional weight of heavy equipment or furniture unless you have had it specially strengthened beforehand. Place furniture on beds and then personal items on the furniture. Electrical equipment should be placed on top. Secure all items that may become hazardous and cause damage if moved by floodwater, for example refrigerators and other large household items. Remove wood drawers from built-ins, cabinets and furniture. Wood swells when wet and the pressure between the drawers and their containers can damage furniture. Remove lightbulbs from light fixtures below flood level. Put the lightbulbs and other glass items in plastic bags and move them above flood level. Protect valuable machinery, equipment and the like that cannot be relocated by enclosing in waterproof covers. Certain machinery may benefit from a coating of grease (please check with the manufacturer prior to applying any substance). Another alternative to consider is encircling such equipment with a wall of sandbags. Relocate chemicals that react with water to give off heat or form explosive or toxic gases and poisons to the highest level in your home in waterproof containers. Include any substances that could contaminate floodwaters. Include cardboard boxes and newspapers etc, as items to be moved to higher ground. If this is not done, they will disintegrate and clog drains. Remove perishable food from refrigerators, place in plastic bags or containers and seal. Tie and anchor outdoor garbage bins to minimise spread of disease and unsanitary conditions. Leave refrigerator and freezer doors or lids open (otherwise they may float, tip over and be damaged or cause damage). Tie down timber, drums and other loose, buoyant items in the yard to prevent them from being carried away by floodwater or battered against other items or structures. Electricity is controlled by either plug fuses or circuit breakers located within a meter board fuse-box mounted on the wall of your home. If flooding is imminent, remove (don’t just loosen) all fuses, including the one at the main switch and at the range switch, and put them in a place above the anticipated flood level. This will minimise the danger of short circuits when the power authority returns service to your home after the flood. If you have a circuit breaker panel board, switch each circuit breaker to the OFF position. Close main gas valve. This valve is generally located on the gas piping just prior to its entry into the gas meter. Gas cylinders/bottles should be tied down or disconnected and moved above anticipated flood height. Close main water valve. It is usually found on the main line where the water supply enters your property at the water meter. Drinking water can be stored in a clean and covered bathtub or in the hot water tank. If the hot water tank valves are turned off and no heat is supplied to the tank, floodwater cannot enter the tank. Anchor fuel tanks to prevent them from overturning or floating. Close fuel tank valves to prevent leaks, spills and floodwater infiltration. Place a strong plastic bag full of sand or earth in the toilet bowl to prevent a back-flow of sewage into your home. Place a strong plastic bag full of sand or earth over shower and bath outlets. Before entering your house, wait until water has fallen below floor level. Wear rubber boots (or at least rubber-soled shoes) and rubber or leather gloves. If you are going into an isolated area, notify the proper authorities. Check with electricity, gas and water authorities to determine whether supplies to your area have been interrupted and are safe to be turned on by you. If the water supply system has been flooded, you must assume it is contaminated. Indoors or out, under flooded or damaged conditions, treat every electrical item with the greatest respect. EVERY SOURCE OF ELECTRICITY CAN BE EXTREMELY DANGEROUS UNDER FLOOD CONDITI0NS. If travelling on foot through a flood zone, observe overhead electrical lines for broken wires or evidence of arcing. Avoid powerlines if possible. If you must cross them, cross under them only at mid-length between supporting poles. Move around slowly and carry a torch as you inspect for damage. Flooring and stairways need particular attention. Watch for loose floorboards, holes in the floor, protruding nails, and sagging ceiling areas that may be ready to fall. Wet plaster is heavy and dangerous; if loose, use a broomstick or any other long-handled device to break it down before doing any work. Take care, as a sagging ceiling may contain a surprising quantity of water. Do not smoke or use open flames, as escaping gas may have collected in pockets of the building. Also keep a look out for other flood "victims” such as snakes and spiders. There is a very real risk of death within a flooded home containing energised wiring. Do not turn on any lights or appliances until a qualified electrician has checked the entire electrical distribution system. Every portion of your electrical system that has been covered with water or mud must checked by an electrician before it is used. If there is any chance of flood contamination of your drinking water, drink only boiled or bottled water until the normal water supply has been declared safe by health authorities. Local water systems as well as private sources are subject to flood contamination, and health officers should certify water sources as fit for consumption. Discard all foods exposed to flood water except those in sealed (airtight) metal cans. Permanently mark the cans to keep their contents identifiable, remove paper labels, and wash the cans in soap and warm water. Then immerse in a solution of three quarters cup of household laundry bleach per five litres of water for two minutes to disinfect the outside of cans. Rinse immediately in clean water. Do not treat aluminium cans with bleach solution. Wearing gloves, wash out mud, dirt, and debris from your home as soon as you can at medium pressure. Use a hose and start from the top or upper limit of the flooding and work downward to the floor or basement. Wash surfaces that have been inundated with floodwaters in order to reduce the danger of flood-carried infections. Pay particular attention to surfaces that children can reach. Wash your hands thoroughly (with a disinfectant soap) after handling contaminated articles. To be on the safe side, consider all items exposed to floodwaters as contaminated. Just because household items have been submerged in flood, does not mean they have to be discarded. Much can be salvaged. Wait until your home and belongings have been thoroughly cleaned and dried before deciding whether to throw out. They may return to good condition or at least be repairable. Much can be salvaged if immediate restoration steps are taken. Mattresses soaked with floodwater generally are damaged beyond use and should be discarded. Feather and foam rubber pillows may be washed but those stuffed with kapok or cotton may not. Clothing that has been submerged in floodwater does not necessarily have to be discarded. Allow clothing that is to be dry-cleaned to dry slowly at room temperature, away from direct heat. Shake, brush, or vacuum loose dirt from the articles before sending them to the cleaners. To clean washable woollen clothes and blankets, first shake and brush to remove dirt, then rinse repeatedly in lukewarm water to remove particles of soil lodged in fibres. Dry woollens in a warm place but not near a fire or in direct sunlight. To clean mud-stained, washable clothing and household linens (other than woollens), first brush off any loose dirt, then remove as much mud as possible by rinsing repeatedly in cool water. Electric blankets should be dried on a clothesline and gently stretched into their original size and shape. They should NOT be used until safety tested by a qualified electrician. Wash lightweight quilts in the same manner as woollens. Dry outdoors in the sun, if possible, to remove unpleasant odour. Thick comforters may need to be taken apart and the cover and filling each washed separately. To further ensure sanitisation of washable articles, sanitise the washing machine occasionally to kill bacteria that live on the interior surface. Pour a disinfectant into the empty machine, then complete a 15-minute cycle at the hot water setting. You will have to make a decision regarding cleaning your rugs and wall-to-wall carpeting. If you leave the carpeting on the floor, you risk fostering wood decay, mildew, and warpage of the flooring by hindering its drying. However, if you remove the carpeting, you risk shrinkage. Although professional cleaners do have methods for controlling shrinkage, the chance of preventing it entirely for wall-to-wall carpeting is unlikely. If linoleum is broken, brittle, and cannot be salvaged, remove it with a chisel or hoe. Be sure to let the underfloor dry thoroughly before laying any type of floor covering. Promptly place pieces of wood or aluminium foil under furniture that has castors or metal caps on the legs to avoid staining carpeting. When weather permits, take all furniture outdoors, but keep it out of direct sunlight to prevent warping or fading. A garage or carport is a good place to work. Remove as many drawers, slides, or other moving parts as possible. If the furniture is made of wood, these will probably be jammed in position. Do not force drawers with a screwdriver or chisel. Remove the back of the furniture – cutting it out if necessary – and push out the drawers. If kitchen cabinet doors or drawers are stuck, do not force them open. Once they have dried they should be easier to open. Clean off all mud and silt from furniture items, using a hose if necessary. To remove mildew from wood furniture, scrub with a mild alkali, such as four to six tablespoons of baking soda to five litres of water. Rinse well with clean water and allow to dry thoroughly. To remove mildew from upholstered furniture, first remove loose mould from outer coverings by brushing with a broom. Dry the article as quickly as possible with an electric heater, fan, or any convenient method to carry away moist air. Sun and air the article to stop the mould growth. If mildew remains on upholstered articles, sponge lightly with thick suds of soap or detergent and wipe with a clean, damp cloth. Use as little water on the fabric as possible to avoid soaking the padding. Wood furniture that has not been submerged may have developed white spots or a whitish film or cloudiness from dampness. Try rubbing with a cloth wrung out of a mixture of half cup household ammonia and half cup water, turpentine, camphorated oil or oil of peppermint. Wipe dry at once and polish with wax or furniture polish. If colour is not restored, dip fine steel wool in oil (boiled linseed, mineral, or lemon) and rub lightly with the grain of the wood. Wipe with a soft cloth. Use a drop or two of ammonia on a damp cloth for deep spots; immediately rub dry with a soft cloth and then polish. If all efforts to remove white blemishes are ineffective, it may be necessary to refinish the furniture. Clean them thoroughly and disinfect inside. Don’t turn them on until they have been given the opportunity to dry out. Have them checked by an electrician first. A flooded hot water system should be repaired by an experienced repair person only. Controls can suffer hidden corrosion damage. They may operate adequately for a while, but cease to operate safely in the future. Testing seldom reveals future problems. Burners or electrical components should not be assembled or adjusted by the home owner/occupant. The main considerations are to dry the building materials and furnishings out as soon possible, and to delay renovation and redecoration for as long as possible, at least until building components are substantially dry. Drying involves: draining, flushing or pumping out mud and water from wall cavities, ducts, service pits and basements; ventilating as much as possible by keeping doors and windows open; taking up floor coverings and moving furniture away from walls; and ensuring good sub-floor ventilation by removing floorboards to assist in drying the floor and floor joists. Drying can also be assisted by the use of fans and heaters. Waterlogged insulation material should be removed. In the case of masonry houses, mud should be cleared from the wall cavities and ventilators. Similarly, repainting and other repairs to cracked brickwork or concrete masonry are best left until the foundation soil has dried out and foundation movements have ceased. Doors and windows should not be replaned to make them fit their frames until the timber is back to its normal moisture content, which may take several weeks. One thing that should be done promptly is to oil locks and hinges to prevent them binding with rust. It is highly likely that wet lining boards and some timbers will grow mould during the drying process. Remove it with hypochlorite bleach used in accordance with the manufacturer’s recommendations. Repeated applications may be necessary as the drying continues. Note that the bleach may affect the colour of some materials. 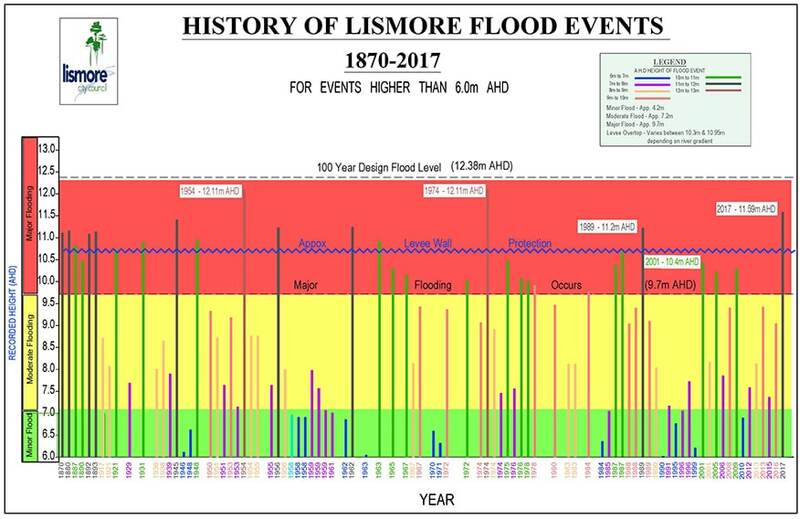 The documents below provide info on flood levels for homes and businesses in Lismore as well as historic flood heights from 1870 until now. Getting ready for a bushfire is easier than you think. By taking 20 minutes with your family to discuss what you’ll do during a fire, you could save their lives, as well as your home. 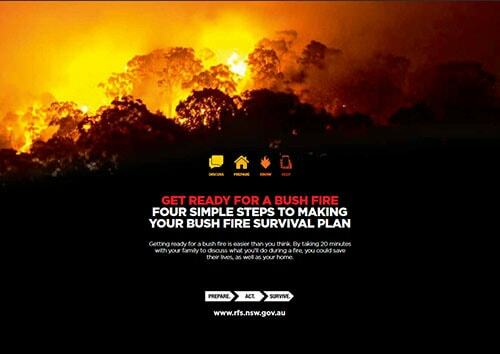 Click on the image to download the Rural Fire Service Bushfire Survival Plan. Many households find that having a discussion over dinner works best as everybody is together and focused. There are simple things you can do around your home to prepare it for a bushfire, like keeping the grass low and having a cleared area around your home. If there is a fire in your area you will find its alert level on the NSW RFS website and in the ‘Fires Near Me’ app. You need to keep track of the alert level so you know what you should do. In a bushfire, it’s important that you stay up to date on conditions in your area. It’s a fact. 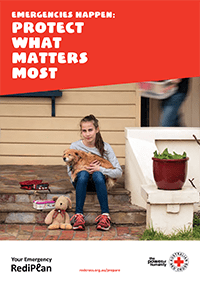 If you and your home are well prepared, you stand a better chance of surviving a bushfire. Visit the NSW Rural Fire Service for more information on how to protect yourself from bushfires. Click here to see current fires in NSW. The Heatwave Forecast is a Bureau of Meteorology website shows the location of heatwaves, severe heatwaves and extreme heatwaves for the last two three-day periods and the next five three-day periods. Heatwaves or long periods of extreme heat can have serious impacts on people's health. Planning ahead and being prepared for extreme heat is important . Click here for important tips to help you know what to do during a heatwave. Visit the NSW Health website for more information concerning heatwaves. Tropical Cyclones are low pressure systems that form over warm tropical waters and have gale-force winds (sustained winds of 63 km/h or greater and gusts in excess of 90 km/h) near the centre. The gale-force winds can extend hundreds of kilometres from the cyclone centre. If the sustained winds around the centre reach 118 km/h (gusts in excess of 165 km/h) then the system is called a severe tropical cyclone. These are referred to as hurricanes or typhoons in other countries. Tropical cyclones can persist for many days and may follow quite erratic paths. They usually dissipate over land or colder oceans. Tropical cyclones are dangerous because they produce destructive winds, heavy rainfall and damaging storm surges that can cause inundation of low-lying coastal areas. Heavy rainfall associated with the passage of a tropical cyclone can produce extensive flooding. This can cause further damage and death by drowning. The heavy rain can persist as the cyclone moves inland and decays, hence flooding due to a decayed cyclone can occur a long way from the tropical coast as the remains of a cyclone move into central and southern parts of the continent. Click here to see real time images and radar information. A landslide is a movement of rock, debris or earth down a slope. Landslides result from the failure in the structure of the materials which make up the hill slope and are driven by the force of gravity. The movement of landslide material can vary from abrupt collapses to slow gradual slides and at rates which range from almost undetectable to extremely rapid. Sudden and rapid events are the most dangerous because of a lack of warning and the speed at which material can travel down the slope as well as the force of its resulting impact. Extremely slow landslides might move only millimetres or centimetres a year and can be active over many years. Although this type of landslide is not a threat to people, they can cause considerable damage to property. Landslides can be triggered by natural causes or by human activity. In general, the factors which influence whether a landslide will occur typically include slope angle, climate, weathering, water content, vegetation, geology, slope stability and the amount of loading on the slope. cracks and subsidence in roads and paths. For more information on landslides, visit the Geoscience Australia website. The Lismore Floodplain Risk Management Plan aims to minimise the community’s exposure to flood hazard in Lismore’s developed areas and ensure that new development is compatible with the flood hazard and does not create additional flooding problems. Controls that apply to new development in the flood-prone urban areas of Lismore are in Chapter 8 of the Lismore Development Control Plan. The Richmond River Flood Mapping Study was jointly funded by (then) Richmond River County Council, Richmond Valley Council and the NSW Department of Environment, Climate Change and Water (DECCW) in 2008 as the first stage of the floodplain risk management process endorsed by the New South Wales government's Flood Prone Land Policy. The study is the first of three studies aimed at understanding and managing flooding within the Richmond Valley between Casino, Lismore and Broadwater. Richmond River between Casino and Broadwater (not including Casino). Bungawalbin Creek from approximately 3km downstream of Neileys Lagoon Road to the Richmond River. Wilsons River from Lismore to Coraki (not including Lismore). Lower reaches of other major tributaries of the Richmond River, such as Shannon Brook (Deep Creek) and Sandy Creek. 1. A calibrated hydrologic model covering the entire Richmond River catchment; 2. A calibrated 1D/2D hydraulic model of the floodplain between Casino, Lismore and Broadwater; 3. Flood mapping of historical and design flood events, in particular flood levels and hazards. Lismore was first settled by red cedar cutters and farmers looking for high quality fertile land. All transport was by boat, using the river system as a major trade route to the sea. Ships could not travel upstream much further than the junction of Leycester Creek and the Wilsons River. This junction was also suitable for the ships to turn around. Lismore grew rapidly around the river trade, timber and agricultural industries, becoming one of the major North Coast towns. In the 1890s the railway linked the river and rail systems, further confirming Lismore’s status as a regional centre. The importance of the river diminished as road transport improved after WWII. By this time Lismore was a major city, established adjacent to the Wilsons River. While the location of Lismore is ideal as a service and trading centre for produce and freight, floods come very quickly and consequently have a major impact. During heavy rain, rainfall from the high surrounding hills comes down the steep creeks and rivers meeting at Lismore, then slowing down and spreading across the floodplain before moving out to sea. 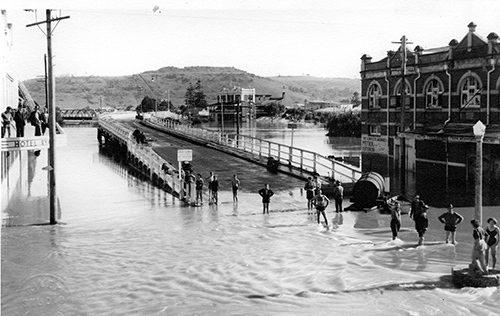 In 1954 and 1974 Lismore experienced very severe flooding, creating major problems for the community. Following the 1974 flood, the government of the day commissioned a number of studies to consider ways to overcome the Lismore’s flood problems. The then government assisted with the purchase of land at Goonellabah to create a new commercial area and new planning schemes to limit growth in floodplain zones. A voluntary purchase scheme aimed at assisting people to move out of the seriously affected flood zones was also introduced. The study concluded by stating that it would be very difficult to construct a levee system for Lismore. 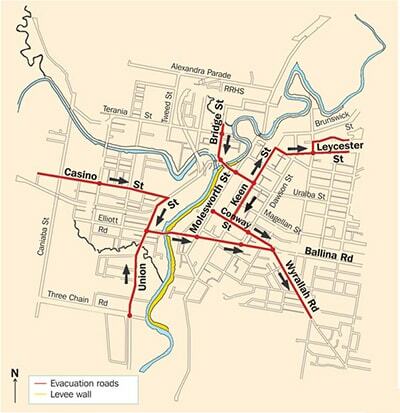 Following the 1989 flood the concept of a levee to protect the CBD was again investigated. After examining the hydraulic effects of more than 20 possible levee schemes, it became clear that it was both practical and financially feasible to construct a limited levee system around South and Central Lismore. 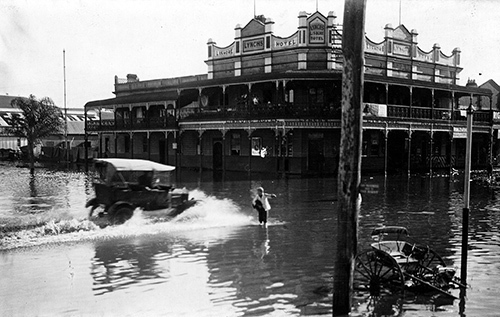 In 1999 a government-funded scheme to protect the CBD and South Lismore from a 1-in-10-year flood event was approved. This proposal would mean that most of the smaller floods would not enter the central area of Lismore and substantially improve the time available for the evacuation of residents and the business community in larger floods. In March 2017, the Lismore flood levee was overtopped for the first time, causing one of the most damaging floods in living memory in terms of material and community destruction. Following the flood, Lismore City Council launched its Flood Ready project to develop a comprehensive, community-wide action plan for natural disasters. 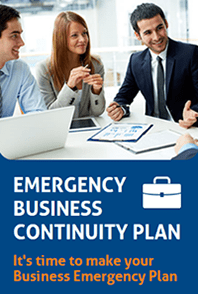 Working with emergency services, local agencies and community groups, the Lismore Flood Ready plan provides a clear framework on how to be prepared and resilient before, during and after a natural disaster. Written by Margaret Henderson, Richmond River Historical Society. Research material and photographs courtesy of the Richmond River Historical Society. Periodic flooding has always been part of life on the Richmond River. The early cedar-getters used flooded creeks and streams to float their logs downstream to mills, or to the ships which carried them to markets in the cities. 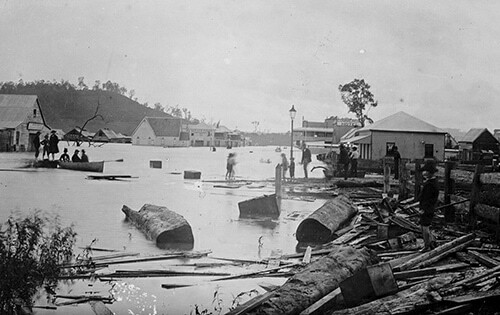 In a major flood in 1861 a large number of logs broke loose, swept down the river and crashed through South Beach at Ballina. The logs continued on their way to become a major shipping hazard at sea. There were three floods on the Richmond in 1861. 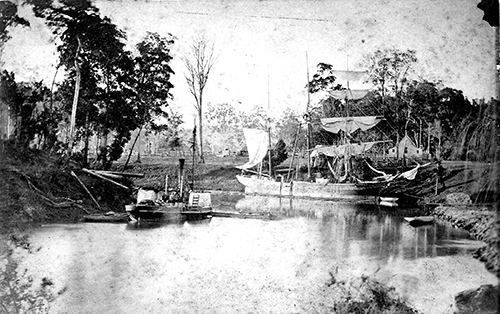 Then, in 1863, Casino took the brunt of the flooding, with Lismore again being inundated in 1864. The 1870s and 1880s saw more flooding, especially in 1889. In 1893 there was a major disaster when the river peaked at 29'3" (8.92m), started to fall, and then rose rapidly again to 34'3" (10.44m). As with all disasters, however, there are the accompanying stories of courage, goodwill and humour in times of flooding. These stories are usually remembered long after the danger has passed, and many have been recorded in local newspapers. In 1931 flood refugees were housed at the Lismore Showground. The Northern Star reported that there was a mixed crowd of about 250, together with their cats and dogs, canaries and parrots. Constable McInnes, who was stationed at North Lismore, was in charge of supplies and paid regular visits to see whether anything was needed. On two occasions he “removed undesirables to less crowded quarters”. The Railway Station Master provided some railway carriages as sleeping quarters while some people were taken each night by goods train to a railway shed where they could sleep comfortably. In 1945, even the World War struggles going on in the Pacific Islands and New Guinea jungles took second place to the flood. The Northern Star in those days was published in Molesworth Street. It too was affected by the flood but managed to bring out a special flood broadsheet which contained only two or three small paragraphs of war news. 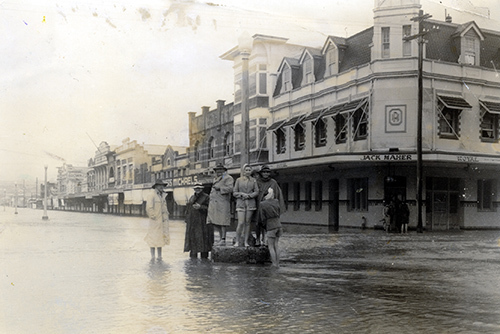 The June 1945 flood was one of the worst in the history of the Richmond. Many people were caught in their homes, especially in North Lismore. Boats were needed urgently and police sent out an SOS. Ballina fishermen answered the call and, with their boats loaded on to Mick Feros' big lorry, they rallied to the rescue. Hour after hour they rowed people to safety. Then the next day they returned with food and blankets. In addition, in 1945 the residents of North and South Lismore were like the Ancient Mariner, when the water supply was cut off! The water pumping station had been considered out of flood reach when built. However, the floodwaters rose swiftly and it was realised that the pumps were in danger of being covered. With the access road covered in water the supervisor, Mr Thorncroft, led his men up and over a hill to reach the pumps. It was a dangerous job as floodwaters began to pour in on the men as they struggled to dislodge the equipment. They succeeded just in time. Presumably they then retreated back over the hill again! Food supplies in the 1945 flood had the added problem of wartime rationing. The Mayor of Lismore telegraphed the Deputy Commissioner of Food Rationing asking for special consideration under the circumstances. In the meantime he authorised NORCO to distribute butter without coupons. Local communications became a problem when Radio 2LM lost its signal from its Molesworth Street studios. This was even more serious because the police telephones (in the police station opposite) had ceased to function. Staff at 2LM were taking police messages and shouting them across the road to the station staff! The situation was solved when an emergency studio was set up at the Goonellabah transmission station. The telephone exchange transferred police calls to Goonellabah where they were sent on to police via radio. When setting up at Goonellabah staff tried to ease the situation by introducing themselves with the theme music Ol’ Man River. It is not only people who suffer in floods. There are always many stock losses. During floods of the 1940s and 1950s, stock were often seen racing down river with the current to Ballina and the open sea: pigs, cows, horses, poultry, sometimes on rafts and often with a snake or two clinging to a piece of driftwood. Brave souls tore after these poor animals and tried to rescue them, and many succeeded. At least one bull did not take too kindly to the whole operation and, finding himself safely on solid ground, immediately charged his saviours! Then there are the people who think a flood is great fun. They go swimming in the murky waters, while others go sightseeing, blocking emergency traffic and holding up would-be rescues. Some paddle around the streets, while others tear around in motorboats not thinking that the wash from their boats can smash plate glass windows. In 1954 and 1974 there were major floods and people coped with them as they had done in the past. And, as in the past, there were the funny stories. One of these concerned a bank whose manager prided himself on keeping up with the times. He had been advised of a new product which would completely seal the strongroom and prevent water from entering. For once staff did not have to move all the precious items from the strongroom and after the flood, the clean-up completed, the seal was removed and the strongroom door opened. To everyone's astonishment (and the manager's embarrassment) a great wave of water rushed out at them, and the clean-up had to start all over again! Many hands were apparently ironing banknotes and other precious items for some time afterwards. Yes, there is always a human touch to every flood!